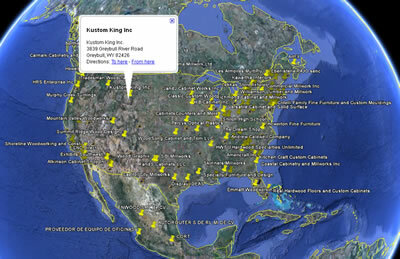 A cool thing we've just completed is adding our Production Sharing Members to Google Earth. Google Earth is a free download, and once you have it, you can click on the Production Sharing Members map of your choice and view all of the Members that list their services on an interactive map. This tool allows you see see at a glance Members who are in your area. For more information, please visit the Production Sharing Area our website. About Production Sharing - This is a free listing service that Thermwood offers any of our CNC Router Owners where they can list their production services and allows any eCabinet Systems Member or other interested parties to contact these Production Sharing Members and have their jobs machined out on a CNC Router quickly and cost-effectively.